Schematic of the STIL system. 3D rendered depth images of a fist model from a stand-off distance of 10 m with time bin size of 0.07 ns. Insets: photographs of the targets from different viewpoints (left) and plots of the corresponded depth data (right). Streak tube imaging lidar (STIL) has attracted considerable attention in recent years because of its high range accuracy, high sensitivity, and wide field-of-view (FOV). This technique has been widely applied for target identification and DEM mapping. The group led by Prof. Deying Chen, from Harbin Institute of Technology, investigates the effect of time bin size on the range accuracy of the STIL system and improves the accuracy of 3D depth images by using an optimal time bin size. The details of the study are reported in Chinese Optics Letters, Vol. 14, No. 2, 2016 (G.C. Ye et al., Effect of time bin size on accuracy of streak tube imaging LIDAR). The STIL system employed a streak tube camera as the detector, which separates the signal captured along the vertical direction, according to the different arrived times of the target return. Then, a 3D image can be reconstructed from multiple pulses by scanning the scene with a 1D laser fan beam. The theoretical analysis shows that the range accuracy can be improved by decreasing the time bin size based on the peak detection algorithm. 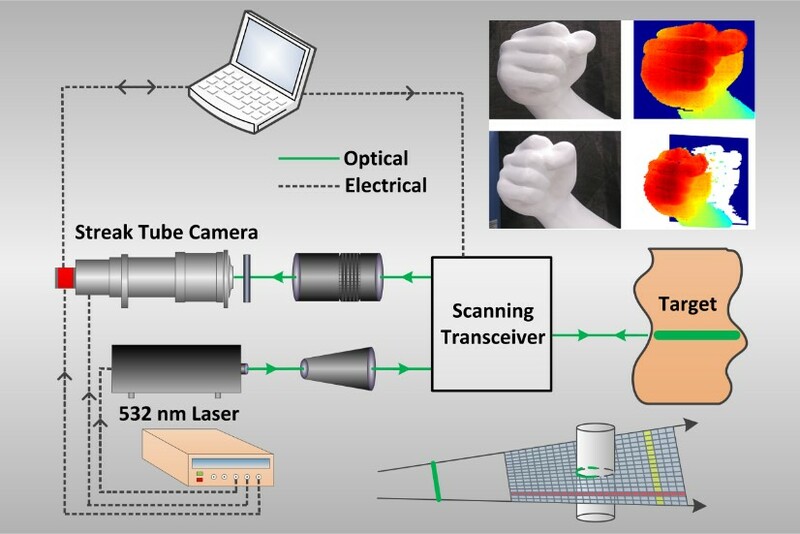 In this study, a modified analytical estimate of the STIL system played a significant role in the analysis of the range accuracy and finer millimeter-scale 3D images were obtained using the improved STIL system. 3D images with different time bin sizes were compared, and the relationship between the range accuracy and the time bin size was established. The finest range accuracy of 3 mm has been obtained using a small time bin size of 0.07 ns. This indicates that a smaller time bin size can help improving the range accuracy. Prof. Rongwei Fan believes that it is noteworthy that the smaller time bin size will result in a narrower range gate. Therefore, an adequate range gate for the required target should be guaranteed before choosing the optimal time bin size. In the further work, the group will perform research on how to determine the best time bin size when the depth of field is known, and will carry out an outdoor experiment to illustrate the theory at a long stand-off distance.